Are you thinking about starting your own fitness studio or gym and want top-notch equipment? How much money have you set aside in your fitness studio business plan for gym equipment? As quality equipment is pricey, you need to be selective on the pieces you buy first which means you need to make sure you get the top requested gym equipment a fitness studio will need. Price is a factor, so here is a list of the fitness studio equipment you need and how to easily get them. Your clients will expect gym equipment that gives them a good cardio workout. You will need commercial grade treadmills that have a variety of speeds, inclines, and monitoring of heart rate. Treadmills will cost between $3500 and $10,000 each brand new. Stationary bikes are low-impact equipment that really gets the heart pumping quickly. It is also a great alternative to your gym’s treadmills. It also works out different neuromuscular areas than other aerobic fitness machines. Stationary bikes cost $2000. Rowing machines are full-body equipment that offers your visitors an intense aerobic workout. Unlike the treadmill and bike that build the lower body, a $1300 rowing machine works out the core, upper, and lower body while burning tons of calories. You will need a commercial training bench for weight training exercises. It must be adjustable so that you can move between positions and inclines. You will need at least two adjustable platform training benches in a fitness studio which run about $400 each. These are critical fitness gym equipment. Dumbbells come in a range of weights which you will need to diversify to attract different weightlifting users. They also come in a wide range of shapes, sizes, and materials from metal to plastic which you need to consider based on the type of clientele you hope to attract. From 55-lb Olympic barbells to the removable plate bench press and squat rack, barbells are also a vital asset to invest. Kettlebells will also be a great alternative to have in your fitness gym as they come in various weights and sizes that work out different muscle groups. Set aside $2000. You will have clients that enjoy doing pull-ups and chin-ups, so you need at least one pull-up frame and bar in your fitness studio that will run you around $250 new. Whether you decide to offer training classes or have a set place for core classes, you need exercise balls for stability training, bicep curls, plank knee tucks, or chest presses. You will be able to get all these gym equipment pieces by shopping at Fitness Depot Direct. When you buy refurbished gym equipment, you save thousands on gym equipment essentials. You will also reduce your losses with refurbished gym equipment depreciation life ROI. 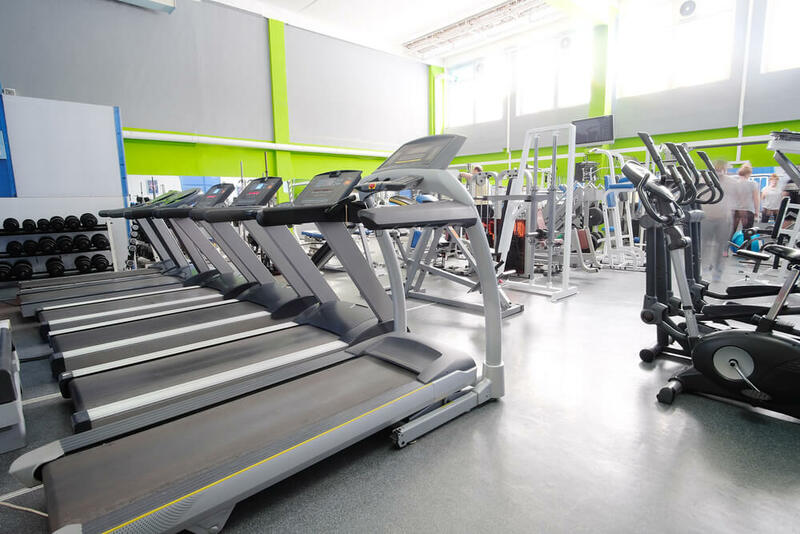 Fitness Depot Direct will provide you access to cheap refurbished gym equipment that will fill a fitness studio design layout with the best commercially made brands that your clients will want to see.